The eastern suburbs is one of the most beautiful areas of Sydney with breathtaking harbour and ocean views and some of the best beaches in the world. It is definitely an area worth exploring and what better way to do this than on a bicycle? There are five rides, graded for varying levels of experience and fitness. 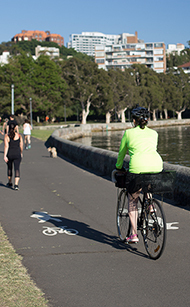 For more information, download the Cycling in Waverley and Woollahra cycle map (PDF, 1.7 MB).